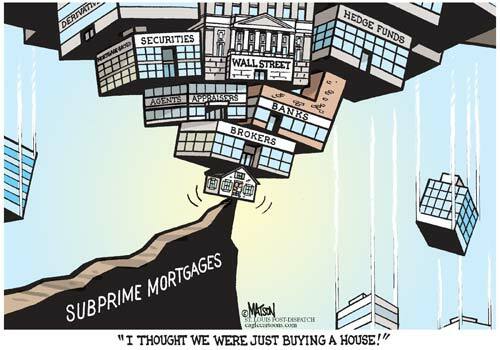 The Urban Politico: The Bundling of Subprime Loans by Asset Managers...Again! The Bundling of Subprime Loans by Asset Managers...Again! Per the Wall Street Journal, there are at least two private investment firms out there that are still leveraging riskier "subprime" loans: Athas Capital and New Penn Financial. Since the subprime financial collapse of 2008, banks have progressively implemented stricter guidelines for lending, especially on mortgages. In an attempt to keep this crisis from happening again, Congress passed the Dodd-Frank Wall-Street Reform Act in 2010, but it doesn't appear to have completely stopped investment firms like Athas and New Penn. Here is where things get pretty interesting and why we should all be concerned. Even though you and I have not taken out a risky mortgage with Athas or New Penn, borrowers of Athas or New Penn have the capability to end up in our retirement funds, credit cards, educational savings plans and even your basic checking accounts. Leading up to the crash of 2008, private investment firms like Athas and New Penn formed partnerships with investment banks, hedge funds and private equity firms. In most cases, all of these entities sit under one roof. In simple terms - lets say you bank with "Jim Bob Bank." Most of us think of "Jim Bob Bank" as a basic bank that handles our checking account, savings account, a few money market or high-yield savings accounts, your credit card accounts and mortgages. This is known as retail banking. What sits at the head of most retail banking structures is an investment bank. Investment banks are out to make profit and maintain a strong client base. The best way to do this is to make sure that their institution is a one-stop shop, making sure that you keep all of your business under one roof. Investment banks have many umbrellas and many times you don't realize that your bank is a part of a larger financial institution. Within those umbrellas, in accordance with competition and a profit structure, will be a hedge fund, asset management (private banking or wealth management and institutional investors) and sometimes private equity. Asset Managers are the major players. They have the capacity to leverage clients on the private wealth side and institutional side, making them the more attractive business line of investment banks to outside private investment firms, private equity funds and hedge funds. According to the promotional video on Athas Capital's website and their CEO Brian O'Shaughnessy, this lending spree is different from the sub-prime lending spree of the past. What Mr. O'Shaughnessy is not telling us or his borrowers is that the old practice of bundling has reemerged to take it's rightful place at the profit table. When a lender underwrites a mortgage, they make as much money as possible up front with the interest rate and fees. Once the borrowers closes on that loan, to ensure their investment and pull in capital to make more investments, the lender sells the loan to an investment bank to be bundled with other loans and investment products. The investment bank then sells the bundles to their asset management clients. These clients invest their capital into these bundles via funds or products. Essentially money keeps recycling its way through the system. Suzy Q works and lives in New York City and is in the market to purchase a modest studio in New York City. Suzy earns $91,000 a year as a analyst, she has $75,000 saved for a down payment, a credit score of 760 and her home bank has pre-approved her for a mortgage of $428,000. Suzy finds a nice studio in Greenwich Village with a sticker price of $365,750 and a monthly maintenance fee of $962. Perfect! Suzy closes on her studio with a standard 30-year fixed rate mortgage with a rate of 4.89%; 360 monthly payments of $2445.00. So far this example seems like the proper way to go. Suzy had a high credit score, and she had savings which allowed her to put a 20% down payment and a standard 30-year fixed rate loan. However, Suzy's home bank will more than likely bundle her mortgage (unbeknownst to Suzy) with other financial instruments and sell them to investors via investment banks through their one-stop shop. The only difference here between Suzy and the many subprime victims of 2008 is the likely hood of Suzy defaulting on her loan and affecting the bundle that her mortgage is included in. If we make a few adjustments to Suzy and send her to Athas, we would see a completely different picture and recipe for default and screaming scared investors. Athas lending rates are a minimum of 8.99%!! (yes I know the average is 4.50 to 4.90%). Let's give Suzy a credit score of 600 and keep everything else in place. According the Athas, they are requiring higher down payments that average 40%. So this now puts Suzy's down payment at $146,300 (as opposed to the $75k she put down in our earlier scenario) and her monthly payments would total $2726.00. Yes, I understand it's only a difference of $281 per month, but keep in mind Suzy had to come forth with a 40% down payment in order for this calculation to work out for a 30-year fixed loan. Since Suzy doesn't have $146,300 to put down towards her apartment in Greenwhich Village, then this must be the end of this story, right? Wrong. Ladies and Gentleman , welcome to the trickery of the financial services industry - ARM's (adjustable rate mortgages) or ballon payments. Bundling at its finest which equates to profits. Suzy will be offered a lower interest rate for a period of 3, 5 or 7 years and after that period the rate "adjusts" and can continue to do so for the remainder of the loan, based on the lender and ultimately market conditions. Borrowers were enticed to take these loans with the promise of refinancing the principle balance at the end of the ARM, right before the rate adjusted. The comfortable payment has the potential to sky rocket, giving Suzy a higher chance to default. Investors who've unconsciously purchased portions of Suzy's loan will now begin to see lower returns on their investment and begin running for the hills until the entire thing tanks. In reality, Suzy's original lender Athas has already profited when they sold her loan to an investment bank for bundling. By the time Suze defaults on this loan they've already moved on to their next victim. Is this type of activity proof-positive that Americans need the Consumer Protection Agency? If the CPA does not become an active agency, how can the federal government stop this type of lending? Should the federal government be able to stop this type of free market lending? Is Wall Street taking us toward another financial crisis?